Going on a cruise vacation means witnessing an elusive paradise! If you have ever had an experience you know what it means to see the sun, sea, varied cultures and people together at one place. The deck is always bustling with entertainment activities and elegant dining. And as the ship moves, one realizes why one didn't come for a cruise vacation like this before. At New Dreams Destination we provide excellent Cruise Services. 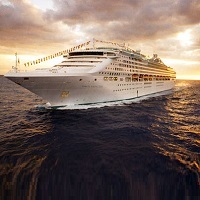 We organize tours on various cruise lines. We always know when and which cruise ship is taking the next route. So, contact us! We would make you land in your dream ship that has gobs of recreational and food outlets, and floating 5-star resorts. We are located in Port Blair, Andaman & Nicobar Islands.